We are ALWAYS READY to take your order for buckles or suede fringed rifle cases. Sit a spell and look over the custom leather items we make, including holsters, gun belts, knife sheaths, rifle scabbards, saddle bags, spur straps, hat bands, buckles, and more. We also make modern gear. 1. All photographs on this website are copyrighted and may NOT be used or reproduced in any manner without specific permission for rent or use photos and/or descriptions. 2. PLEASE READ BELOW TO CHOOSE WHAT YOU WOULD LIKE, THE COLOR, AND HOW TO MEASURE FOR A BELT BEFORE YOU CALL. 3. We enjoy personal input and historical discussions. For this reason we DO NOT use a shopping cart concept. Call anytime between 9:00 AM and 7:00 PM East coast time. The phone will not be answered before or after this time. 4. Currently we are about 6 -7 MONTHS in back order and the wait is worth it- We appreciate your interest. 5. Chisholm’s Trail does NOT receive or respond to text messages or photos, please e-mail these items. 6. Upon Request- Gun Leather sets will come with a “Certificate of Authenticity” for only $10.00. However, If your order is the first one of the style or pattern, then you get your certificate FREE. 7. For a lining add $49.95 per piece. 8. For antiquing and distressing the cost is $49.95 per piece. 9. Standard shipping and handling is $19.95 for priority USPS with tracking and insurance. 10. For hammer thongs, leg ties, or snap straps add $10. 11. For bullet loops over 18 add $1.00 per loop. Here at Chisholm’s Trail, we have visited most of the significant museums and private collections in our quest to bring accurate, authentic, historical gun leather to light. 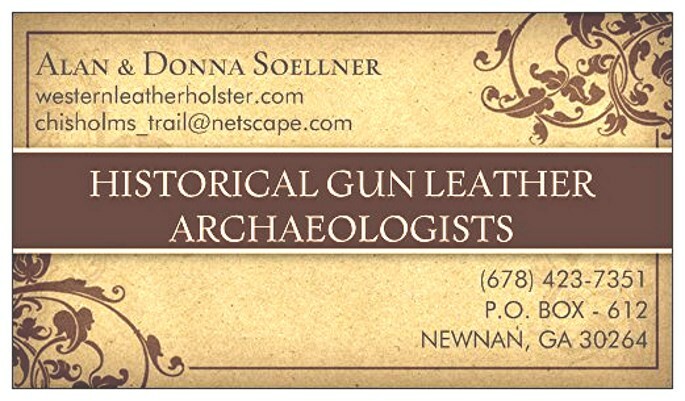 Therefore we have started a new endeavor called “HISTORICAL GUN LEATHER ARCHAEOLOGY. ” This will involve all of the tasks and research details we have learned in the past twenty years. We will continue evolving this discipline as we bring to light more famous outlaw and lawman leather that would have been lost to posterity if these processes had not been completed. You would be surprised at how many museums are closing and selling these items. Once they are in private collections it is almost impossible to see or examine them ever again. If you know of a historical holster rig that we do not have on this site, or a unique buckle, please contact us . Chisholm’s Trail introduced the new (Air, Sea, & Land) ASL-5 SCOUT Tactical / Survival knife at last year’s Atlanta Blade Show. At this year’s Blade Show we introduced our new ASL-4 FIRST RESPONDER. These blades have gained so much interest that the FMG Publications staff touring the show interviewed Alan Soellner about this line of superior blades. Click on the arrow above to watch the video. More about these knives and pricing on our knife button. CHISHOLM’S TRAIL OLD WEST LEATHER SM, LLC. Chisholm’s Trail Old West Leather is official and trademark has been applied for. 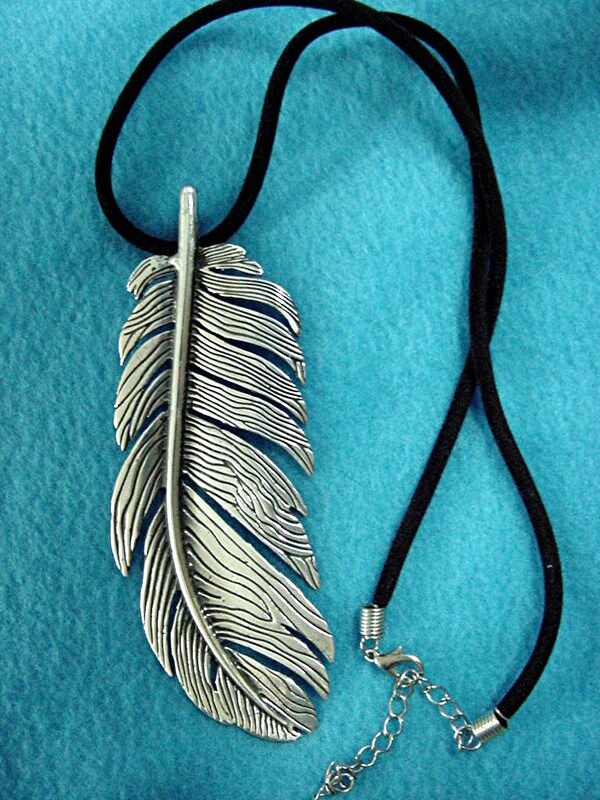 Our designs and accessories are copyrighted and can not be replicated in any way, shape, or fashion. All prices are subject to change at any time due to materials price increases. RIDE FOR THE BRAND – That was a phrase used in the old west. It means that you’ve got loyalty, pride in yourself, your job, and the land. So saddle-up, toughen-up, cowboy-up and buy Chisholm’s Trail gun leather. We do NOT have a shopping cart. We feel that is rude and we prefer to spend time talking to you and tailoring Old West cowboy leather to your specific needs. Please look below for your color choices. Most of your questions will be answered by reading this home page. ABOUT US: Here at Chisholm’s Trail we produce all our Old West gun belts and cowboy gear from original historic pieces or period patterns from vintage sources. Many items we make are similar to examples found in the National Cowboy Museum in Oklahoma City, The Gene Autry and Buffalo Bill Cody Museums. Others are from the pages of the book “Packing Iron”, “Tombstone – The Guns and Gear”, and similar great collections of the American Cowboy, featuring Old West gun belts. ***We have not raised our prices in many years. However, because of the constantly increasing costs of leather, oil base stain, saddle finish, hardware, shipping, handling and other factors we are having to raise our prices by $10 per item. If you are in a hurry this might not be the place for you. We are currently about 6 -7 months in back order and the wait is worth it. We take great care with each item and the name does not go on till the quality goes in. All exotic hides and skins we use are obtained legally and we are assured the proceeds go for game management and improvement in wildlife habitat. Note: we only use free range American cattle hides, therefore you will occasionally find an insect bite mark, wrinkle or a barb wire scar. This is unavoidable and adds to the authenticity of the piece. Our leather gear is made in the natural russet color from the tannery. We charge $10 per piece for oil base stain and hand rubbed saddle finish. Chisholm’s Trail Old West Leather can directly trace its roots to Jesse Chisholm who blazed the first famous cattle trail North out of Texas. Alan Soellner, who is a descendant of Jesse, has visited many of the old leather & saddle shops in the West and has learned “Sheridan Carving” from K.C. Krueger and some of the other current masters. He learned leather working skills from John O’Rourke of Hartsell, Alabama who is one of the best leather crafters extant. This is why craftsmanship on our Old West gun belts is rare and of high quality. Valuable advice has also been shared by Will Ghormley, a great pattern maker. Alan has been personally trained by the world famous John Bianchi, Holster Maker to most western movie stars from John Wayne to the present day. Bob Arganbright has been especially helpful with his knowledge of movie and TV western rigs and patterns, Jeff Carnes has helped numerous time and is a master when working with curved cowboy belts and floral tooling and has won significant awards. Donna, my wife and partner, grew up in Peabody, Mass., the town called Tannery City. Her father made his living by tanning leather and her mother colored leather for the Lawrence Leather Company. 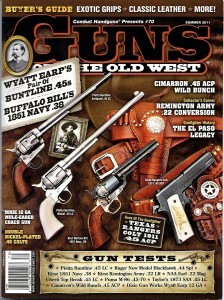 The magazine cover “cowboy single action holster” to the left is our Buffalo Bill set. The 45 auto holster is made by John Bianchi of Frontier Gun Leather.com. 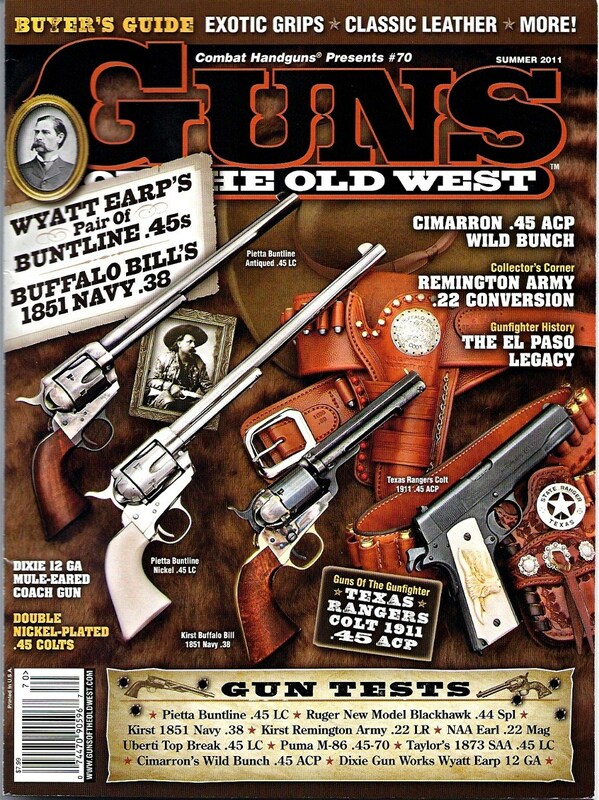 Chisholm’s Trail holsters and belts are also often featured on the cover of this magazine. For the finest in cowboy history, guns and gear be sure to immediately order your subscription to “GUNS OF THE OLD WEST” magazine. You get a discount by ordering on line. They are really great folks. 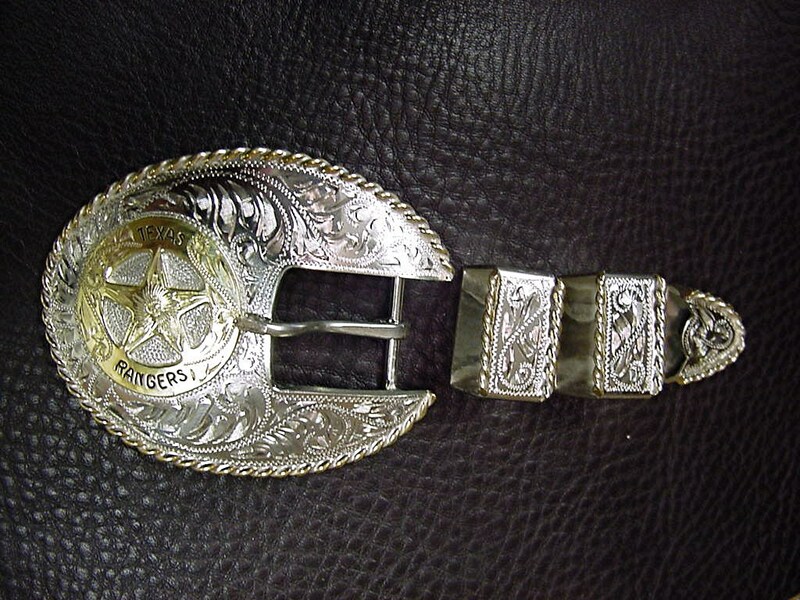 Don’t forget to view the “BUCKLE” button for our continually growing line of historical and western movie buckles. We do not believe in the “shopping cart” concept. We prefer to talk to our customers in person and provide input. However, we can complete some orders over the internet if you wish. Please feel free to contact us anytime reasonable East coast time. Call (678) 423-7351. Basic rigs are unlined and the gun belts are provided with up to 18 cartridge loops (additional loops are $1 each) and an edge groove. 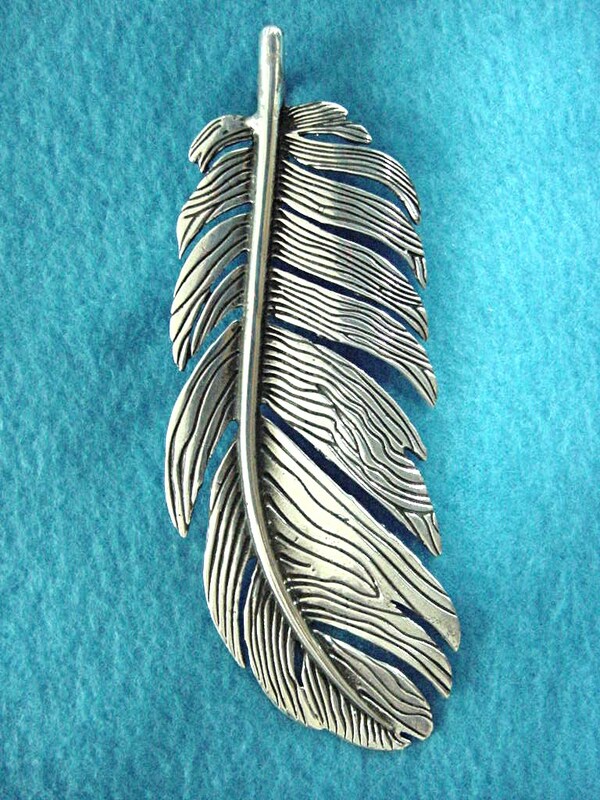 To add one line of decorative edge stamping add $10. For double line stamping add $20. Finally for full coverage stamping such as basket weave or floral carving on a holster or belt add $49.95 each. For lining add $49.95 per item. Shipping is a standard $20 USPS priority, insured with tracking. COLORING: If you are wanting several items please try to order them at the same time. We are then able to cut them out of a single cow hide. If you order at different times or we have to use different thicknesses or leather in your order it is possible there will be a slight difference in color within the same shade. When you order, note that this, as well as normal small bites or barb wire marks show the character of the leather and as such not something we can control or guarantee. 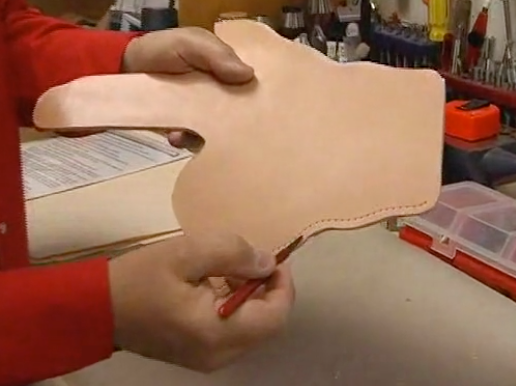 We produce all of our items in russet, vegetable tanned, Wickett & Craig fine tooling leather. For oil base color stain in Saddle Tan, Cowboy Brown, Old Walnut, Chocolate, Gunfighter Black, or Havana Mahogany add $10.00 to each item. Please note! 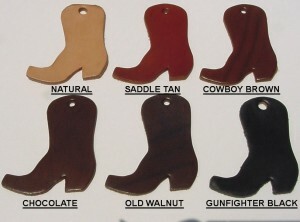 that variations in color and darkness will occur from one cowhide to another. We can not guarantee the exact shade. The final process will be hand rubbed saddle finish. Leg ties, hammer thongs, or snap straps add $10.. Shipping and handling will be $20.00 depending on the box size and destination. There will be additional charge if special shipping or large boxes are required. Rifle scabbards add $30 shipping. 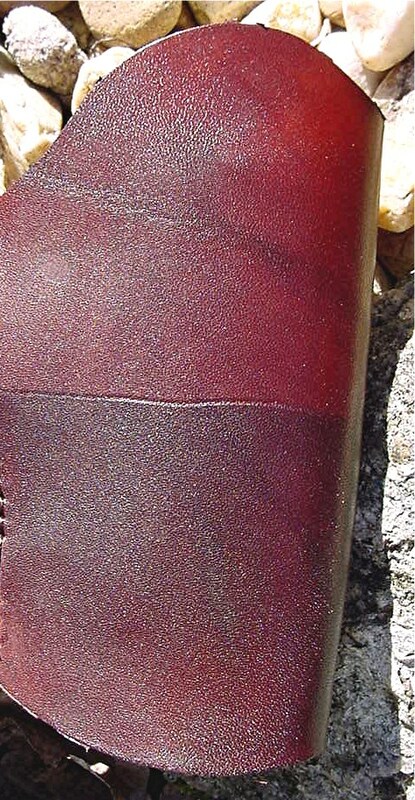 After several requests we are adding “Havana Mahogany.” This is a deep, rich, dark reddish color that adds class to your holsters- especially the modern ones. Top is one coat and the bottom is two coats. DO NOT trust your pant or belt size as marked. Take a soft tape measure and put this around your midsection right where you would like to wear your gun belt, over the clothes you are going to wear. Snug it up horizontally and give us that measurement. We will make several additional holes so you will be able to adjust as needed. For pant belts measure inside your belt loops. Belts longer than 49 inches add $20 to cost. Normally belts would have 5 or 7 holes of your choice. We have been asked to do this for several of our holster rigs in movies. This is a time consuming and dusty process requiring wearing a mask, rubber apron, gloves and glasses. Please add $49.95 per piece for this process. Chisholm’s Trail has been asked to provide authentic cowboy gun leather for display at the following museums: The Billy the Kid Museum in Ft. Sumner, N.M., The Booth Western Art Museum in Cartersville, GA., and the Texas Ranger Museum in San Antonio, and the new Texas Ranger Museum in Fredericksburg, TX. When possible Chisholm’s Trail obtains original examples of period gun leather and will often display them with reproductions to enjoy. To understand how a cowboy holster should be made please take the time to view the video below! Chisholm’s Trail Leather from SMD Productions on Vimeo . “Upon Request” Gun Leather sets will come with a “Certificate of Authenticity” for only $10.00. If your order is the first one of the style then you get your certificate FREE. NOTE: Indian replicas not made by Native Americans as defined by 2.5 USC & 305 ET SEQ. Social Media tags: old west gun belts, western leather holsters, custom western belts.